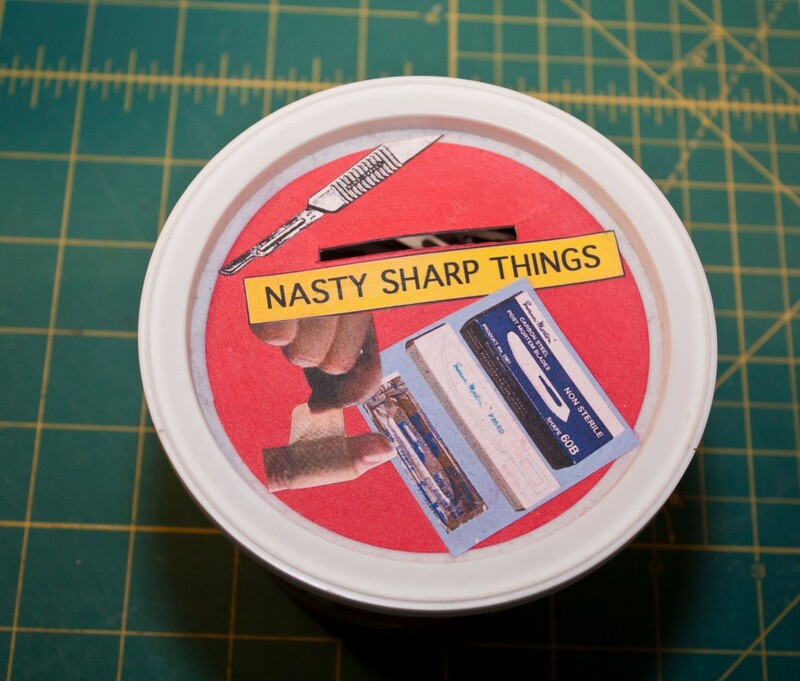 Add comments Tagged with: "sharps container for craft knives" "nasty sharp things"
Oh, yes. 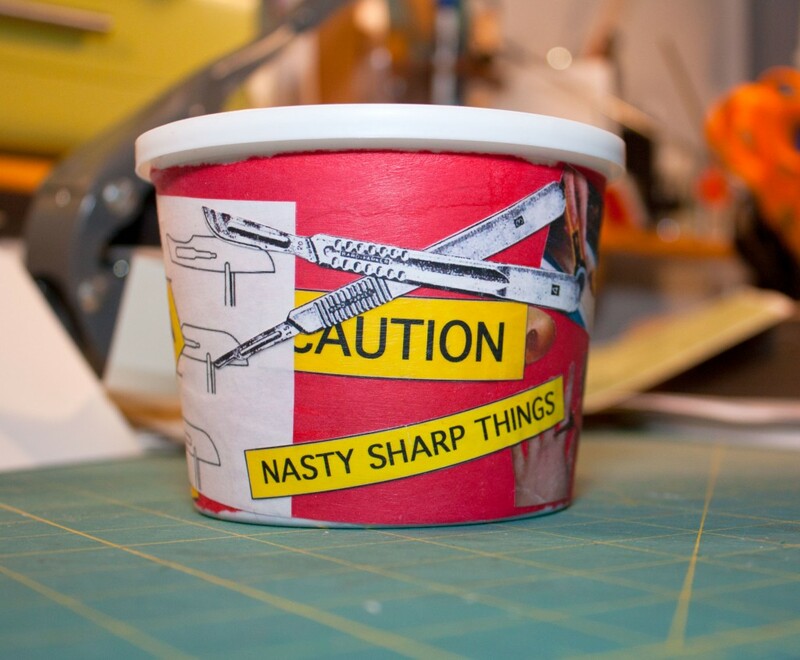 The sharps bin. And you’ve reminded me that, long before the punk fashion for safety -pins -in -earlobes was a fashion statement….I had an old safety razor blade on a chain! I’d scraped the edge off it, of course! Oooo…. I love your taste in jewelry! Perhaps I should give the other chipmunk a scalpel? Hmmm…. I loved your sharps container. It made me smile more broadly than much has this week. Why didn’t I have one when I was doing patchwork and the cutter’s blades were blunted far too easily. The decorative piece in the studio has charm as well. Glad I could bring you a small bit of pleasure. I had a lot of fun browsing online for things to decoupage onto the container, I can tell you. Cool idea. I must admit that I throw mine in the trash — the trash that gets thrown into a bag, that gets picked up by the bag and tossed into the garbage truck, that gets shoved around the floor of the transfer station with a backhoe. I don’t believe ungloved hands will ever get near that sharp thing once I throw it out. Less of a problem now that we have an animal-resistant can, but our garbage used to get raided and spread around from time to time. It was as much because of that as anything. And I also don’t want to injure myself while pushing the bags down into the can. But true, the odds of anyone at the garbage pick-up end actually coming into bare-handed contact with anything inside is likely remote. If it were a problem, we wouldn’t be able to throw away broken glass, for instance. To be honest, I think part of what I like about having this is that it’s like having a little sign next to my table reminding me to change my blade. It’s become a part of my ritual and encourages me to keep a sharp blade. Your way is much better. Years ago right around Christmas I visited friends in Eureka. Jokingly my husband and I looked up at all the plates and tchotchkes up on a high shelf that went all around the kitchen and inquired if they weren’t, perhaps, worried about earthquakes? They’d never really thought about it, they said. In less than 24 hours we had a big one centered quite close to Eureka. It knocked all those plates and everything off the shelves, including a bottle of vinegar that landed on the computer, ruining it. The one friend still occasionally narrows his eyes and hisses “Witch!” at me. It can be dangerous to be the prophet, you were lucky not to be stoned and driven out of town! Thanks Angela. Of course, this does mean that eventually you’ll wind up with a tub of blades to dispose of, but I still haven’t gotten there yet! I hadn’t thought of the gulls (good point), but animals getting into our trash on garbage night have been a big problem. It’s usually raccoons, but occasionally some bigger visitors. I keep meaning to take a picture of a souvenir cat food can that was left behind some years ago by a bear that had made off with the rest of our garbage. (I actually was in my studio at the time and saw it–or at least its large hairy back that took up the whole window.) The can has some impressive claw (or teeth?) punctures in it. Still, I wouldn’t want a bear, or raccoon, to get torn up with scalpel blades.